Feel free to comment on the proceedings! Just hilarious!! Thank you Zombie and others. Never has the merging of street performance and political protest been so clear. The best example is the “3/4 white black guy” in New York. Watch his schtick, laugh, offer him a quarter, and move on. I love the anarchist “anti-corporate-greed warrior” with the handy bottle of evil-corporate “Mountain Dew”. The revolution will be caffeinated!!!!!! The Church of Life After Shopping (formerly known as the Church of Stop Shopping) is an activist performance group based in New York City, led by Reverend Billy, the stage name of Bill Talen. 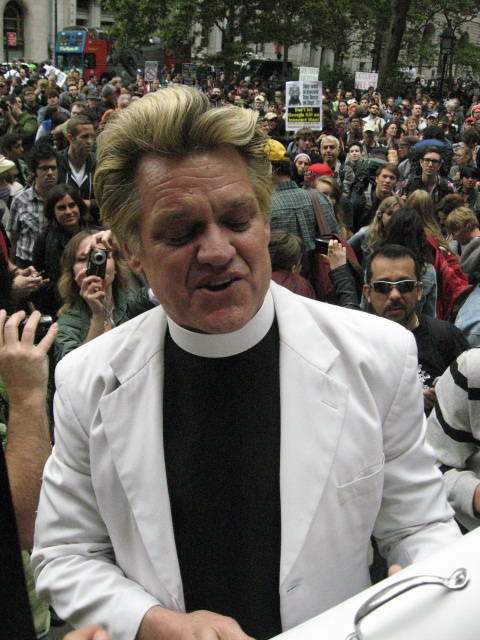 Using the form of a revival meeting, on sidewalks and in chain stores, Reverend Billy and his gospel choir exhort consumers to abandon the products of large corporations and mass media; the group also preaches a broader message of economic justice, environmental protection, and anti-militarism, protesting sweatshops and the Iraq War. Hey, Zombie: Love Reverend Billy and his “blonde” highlights. We are required to be part of the anti-corporate greed crowd, but the good Rev makes it look good, man! White jacket, black shirt, blonde highlights. Bet he has a gold Caddy to go with that…and maybe a Rolex when he’s not on the stump! And why do so-called anarchists all wear those dumb kerchiefs over their faces? Is that supposed to make ‘em tough or do they all have alergies? Bakunin, shed some light there! 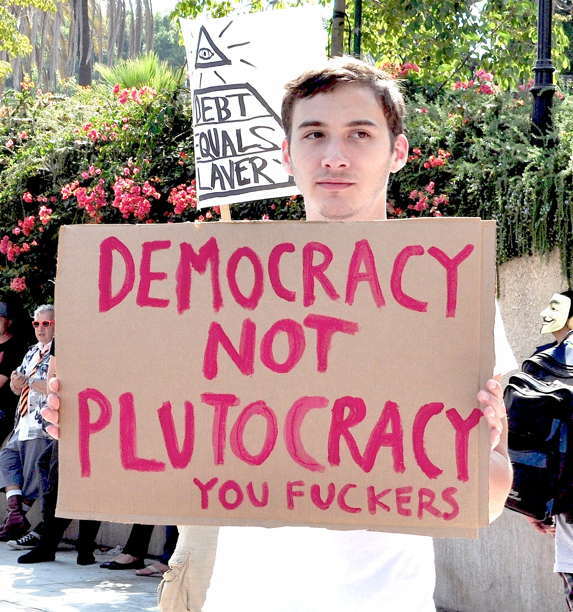 I need a pseudo-anarchist to weigh in. The anarchist’s dress alike, all express the same threadbare leftist agitprop and wear bandit masks – conformity runs pretty deep in their black faction-fashion community. Re: the guy “Mr Sunglasses” who made it into that mall with his portable PA horn–doesn’t he bear a striking resemblance to the …person we’ve seen in other photo-essays of yours, usually carrying some blame-the-Jews rant on a sign? Best regards. Just imagine trying to be a police officer amid this stinking mob of stupidity. You guys are hysterical. LOLOLOLOL!!!!!!!!!!! You can’t understand what’s going on. LOLOLOL!!!!! The recurring thesis of “they don’t all agree, so they’re wrong” is rather idiotic. And if you didn’t mean that to be a recurring thesis, you should consider rewriting. The whole notion of having a big tent, something that all political factions attempt at some point, entails accepting people who don’t agree on certain details in order to push some larger idea that they share. Just look at your own comments section. Is the fact that some people who agree with the message of this blog have called the protesters conformists sufficient for me to go write my own blog about how you said the protesters are too diverse and your commenters said they’re too similar? Is this some giant contradiction that undermines the entire post? No, of course not. Same thing for the protesters. I don’t know that I would necessarily label this protest as “anti-capitalist”, as that makes it sounds like an organized movement with a clear goal. Although, I recognize the need to have a title for your article. What I do think is clear however is that lots of people are pissed, and they have no idea who or what to blame. It seems you cover a great deal of protests, so perhaps you have a good idea for which of these things have any staying power, and which don’t, but I think it may be to early to dismiss this one completely. Don’t get me wrong, I think a leaderless protest with no unified message is bound to fail, but I guess “fail in what way” is the question. I would like to hope not, but theoretically, let’s say at some point, one of the larger rallies goes violent. This is an excellent excuse for any would-be looter/opportunist to cause a little trouble in the midst of the mayhem. Perhaps it’ll fizzle really quick. As I said, you have more experience on that front that I.
I think he’s a Moby. 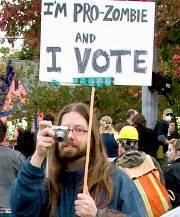 Protest Warrior had a bunch of people infiltrate lefty protests with subversive messages, and that was one of them. I’m also reminded of something some “ACORN©” activist said, just a few years ago, about not wanting a fight *yet,* because of not having an army *yet. * In light of the staying-power of the Parasite-class “occupying” Wall-Street (it’s 07 October and they remain), I wonder if this might be the “army” to which that one referred. It isn’t that they have the discipline or the organizational ability to hold a sweepdown–much-less a revolution. But I wonder if this is that “army.” RKBA! Best regards. It’s still a good life for people whose days involve Situationist street spectacle as a lifestyle. Rather than, say, queueing up with 2,000 others for the six available jobs at McDonald’s. Or being thrown on the street at 50 because some punk in Mountain View invented a new computer code that suddenly is the one and only qualification sought after by the twentysomethings doing the hiring. There is plenty to “be angry about,” but grown ups quickly figure out that anger is an energy to be channeled into doing something positive and productive. Wallowing in it is just tantrums. You guys are hysterical. LOLOLOLOL!!!!!!!!!!! You can’t understand what’s going on. LOLOLOL!!!! LOLOLOLOL !!!!!!!!!! Neither can you or them. LOLOLOL!!!! Having just visited your website for the first time, I stumbled upon this post accidentally. Now eight months on after your initial perception, how can you possibly call this a day of fail?! It dominated news media for a full months. And even after that, it has quickly catapulted issues of inequality and even a conversation around economic inequality to the forefront of national conversation. Can you still call this a day of fail?